Today I had some great fun watching Olympic events with the families of some of the athletes we have connections with in Lake Placid. The day started with a meeting with Teresa over breakfast, encouraging her as she continues to be a light for Christ in her role here in Whistler. Her boyfriend Jeremiah (from Holyfire Ministries) had asked me to give her a high-five the next time I saw her, so I did and we captured it on a photo. I haven't seen the photo yet. As soon as I was leaving my meeting with Teresa, I got a call from Wynn. He was excited to tell me that he was going to be racing today! (Remember, Wynn was the alternate for the US biathlon team, so he didn't know if he was going to get to race at all.) I quickly re-arranged my morning schedule and jumped on a bus to the biathlon race. On the bus, I sat with a delightful elderly lady from Canada. We talked about life in Canada, about the beauty of creation, about the Olympics, about challenges facing young people today, about salvation, and more. On the way into the race, I met some guys who were volunteers for the event. They were excited to learn that I was a chaplain during the Games because they are part of a Christian ministry in British Columbia. I got to the biathlon race in time to see the end of the women's race, and to see the men's race. I met and spent time talking with Wynn's family (from Minnesota) and his girlfriend. Wynn did great, and everyone was very proud of him. Sara competed in the women's race, and she had an outstanding race! I had the chance to meet her parents, and also to spend quite a bit of time talking with her boyfriend Zach Hall. I know Zach from the Athletes Bible Study in Lake Placid. He is a world-class biathlete himself, and he graciously explained the rules and strategy of biathlon to me. I really learned a lot. At the end of the biathlon race, I ran back to the bus and traveled back into town. I jumped off the bus, worked my way quickly through the village, grabbed a bite to eat to go from Starbucks, and met up with Adam Pengilly's fiancee, Ruth, along with both of their families & some of their close friends to watch the skeleton race. I saw lots of Lake Placid friends at the race, and everyone cheered all of the athletes on. The racing was very exciting. The women's race was first, and then the men's. All of the athletes are competing well and giving it their all. After the first two heats of the men's race, Adam is in 20th. Tomorrow will be heats 3 & 4. During the race I met some new friends with Athletes in Action ministry. It was good meeting Tim, Danny & Mike. In summary, today was a great day to be with the families and friends of the athletes. The common bond of Lake Placid helps us to feel close. The common bond of Christ makes us feel even closer! This blog is a daily blessing! 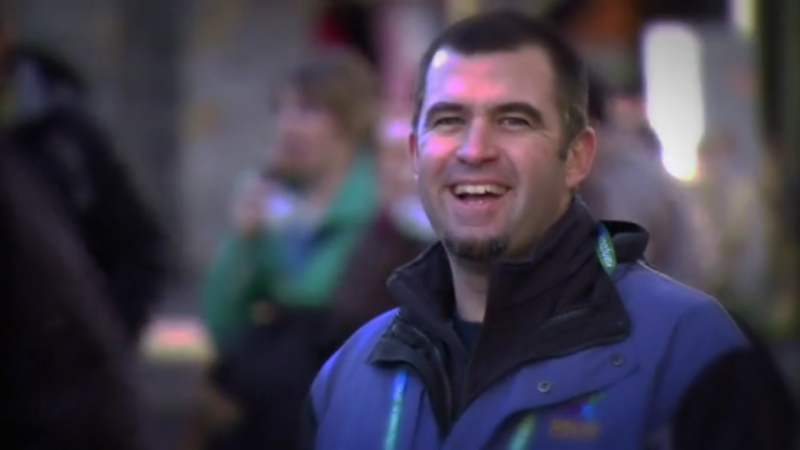 Your church family in Lake Placid misses you Pastor Derek, but how great that we all get to 'walk about' the Olympics with you - and it's so encouraging to hear/read of all the ministries and volunteers on mission at the Olympics - thank you for the links. The athletic events are exciting, but much more so is news of God at work in the hearts and lives of the athletes, their families, friends and fans.